After many agonizing months of trying to figure out how I wanted my business cards to look I finally forced myself to take the plunge before I headed to Alt. Like most creative business owners we forget at times to put our skills back in to our own business. This project took way too long to get to and and left me a little worried I would be BC-less at Alt. Thanks to the wonderful team at Mama’s Sauce my in print partners. They killed these cards. I shot the design over to Nick and asked for his opinion and this was the result. One very positive example of trusting someone who is talented at their craft. The cards are printed on French Paper #220. They are not duplexed as I was asked often when handing them out. 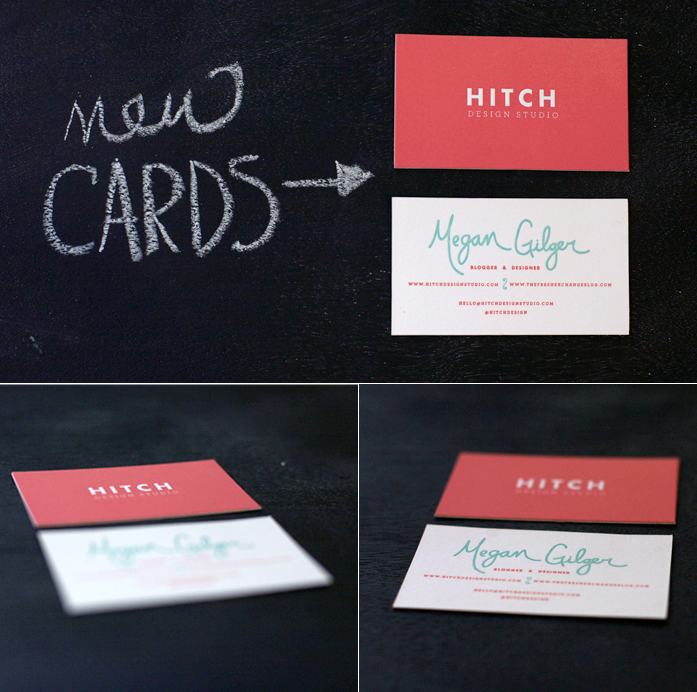 The front is an inverted plate which raised the Hitch logo to create the illusion that we used white ink. On the back was a 2 color kiss press that has less texture but allowed for that deep press on the front. I couldn’t be more happy with how my cards turned out and love handing them out to people. In every way the cards are me and that is the first time as a business owner I feel I can say that. If you are in need of some awesome print work give them Mama’s Sauce boys a holler and let them know you heard the good word from me. Your cards were standouts for sure! Great design and construction. I would’ve never guessed that it wasn’t actually white ink!! How exciting! I love the cards, so cute!